Andy Hampsten caught the public eye in 1985, when he won stage 20 of the Giro d'Italia. The following year, he was signed by Bernard Hinault's La Vie Claire team. 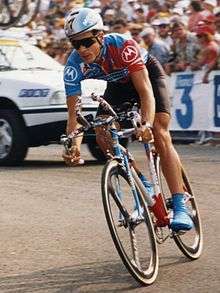 In his first full season as a pro, 1986, he won the Tour de Suisse and helped his compatriot and team leader Greg LeMond to victory in the Tour de France. He also finished the Tour de France fourth overall and claimed the white jersey of best young rider. In 1987, Hampsten repeated his victory in the Tour de Suisse, this time for the 7-Eleven Cycling Team. His greatest moment came in the 1988 Giro d'Italia, on a short stage over the Gavia Pass. 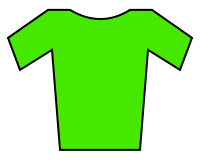 Attacking on the climb, Hampsten overcame a blizzard to take the leader's jersey - although he finished second on the stage to Dutchman Erik Breukink. Hampsten's final highlight came in the 1992 Tour de France when he dropped his breakaway companions to win the stage to Alpe d'Huez. He again finished the race fourth, having lost his third place to Gianni Bugno in the final time trial. Hampsten used to live in Grand Forks, North Dakota and the 40-mile bikeway system there has been dedicated as the "Andy Hampsten Bikeway System." Hampsten now lives in Tuscany and Boulder, Colorado. In 1999, Andy Hampsten and his brother Steve started a bicycle company in Seattle, Washington called Hampsten Cycles. Andy Hampsten also operates a bicycle touring company in Italy called Cinghiale Cycling Tours. 1 2 Black, Forbes. "The Brothers Hampsten". Cycloculture.com. Retrieved 15 May 2011. Story and interview with Hampsten about his 1988 Giro win.